A small cigar with rich taste for those seeking a satisfying small smoke, Romeo y Julieta Reserve Amores cram all of the bold flavor you love into a 4x33 small cigar. A mix of hearty Nicaraguan and Honduran filler tobaccos come together to bring you real satisfaction in a convenient tin that will fit in your coat pocket. I love that little cigar. Tastes excellent. The Romeo Reserve cigar is as close to Cuban quality that I have ever gotten! Good 30 minute quality smoke. Wife likes the smell. Like the tin box for travel. I have tried most brands, and this is an exellent choice. I just love these little things. I tried their bigger cousin and quite honestly AI like these much better. My go to mini cigar when i do not have a tone of time to spend. 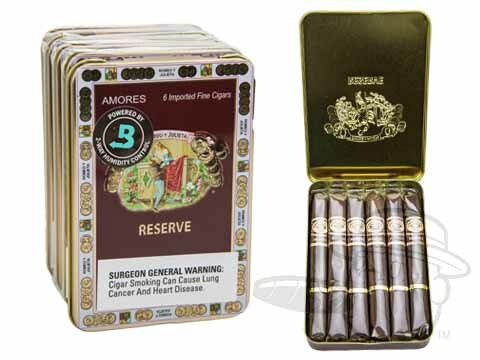 Romeo Y Julieta Reserve Amores is rated 4.6 out of 5 based on 9 customer ratings.